On September 4, 2010, 45 years passed since the Kyiv premiere of Sergei Parajanov’s legendary film, Shadows of Forgotten Ancestors. Incidentally, the film’s premiere was allowed in Ukraine only a year after the film was shown in world’s cinemas and received international acclaim. The reason for such a delay was that director Parajanov categorically refused to show Shadows of Forgotten Ancestors in Russian translation, explaining this by the fact that language is one of integral artistic elements of the film. Both the film and its premiere were deeply symbolical. Shadows of Forgotten Ancestors is a high-quality film, showing masterly work by the director and revealing the previously obscure Hutsul traditions and folkways — a film which, in its time, conquered the world. 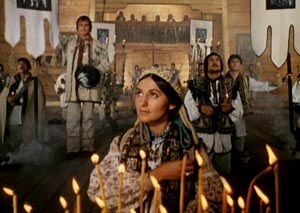 (The Polish magazine Ekran wrote in 1966: “This is one of the most amazing and refined films that we have seen in recent times.”) Parajanov’s film is a rare phenomenon, which shows an integral and authentic ethnic culture with the help of art, thus becoming a bright manifestation of this culture. Kyiv’s premiere of the film is linked with the young Ukrainian intellectuals who openly stood against the state totalitarian system. In commemoration of the 45th anniversary of the event the civic organization Young People’s Movement organized a showing of Parajanov’s film in the Kinopanorama Cinema. It began with a reenactment of the events that took place in early September 1965. After the actions Dziuba and Chornovil were fired, whereas Stus was expelled from his postgraduate course. Soon after that a new wave of arrests began. According to dissident Vasyl Ovsienko, it was during the premiere of Parajanov’s film that Stus first made his civic stand. That moment marked the beginning of Stus’ 20-year period of hardships, which ended with his death in a concentration camp on September 4, 1985. Forty-five years after the premier the hall of Kyiv’s Kinopanorama was once again crowded before the beginning. Most of people present were schoolchildren. They were listening to mp3 players, rather than the dissidents. It was a testament to the gap between the generations, and the loss of traditions. Meanwhile, the state is only pretending to support domestic cinema. Telekrytyka reports that the incumbent Cabinet of Ministers allotted seven million hryvnias for the creation and distribution of national films. Mykhailo Illienko considers that this is enough to finance just one big movie. It may be long before a new Shadows of Forgotten Ancestors appears.